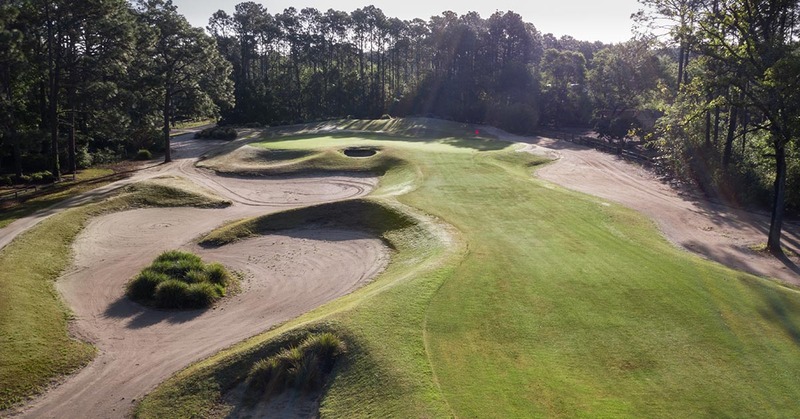 The Founders Club in Pawleys Island, about 20 minutes south of Myrtle Beach on Highway 17, opened for play in 2008 and attracts golfers because of its unique appeal: sand instead of long, unforgiving rough. 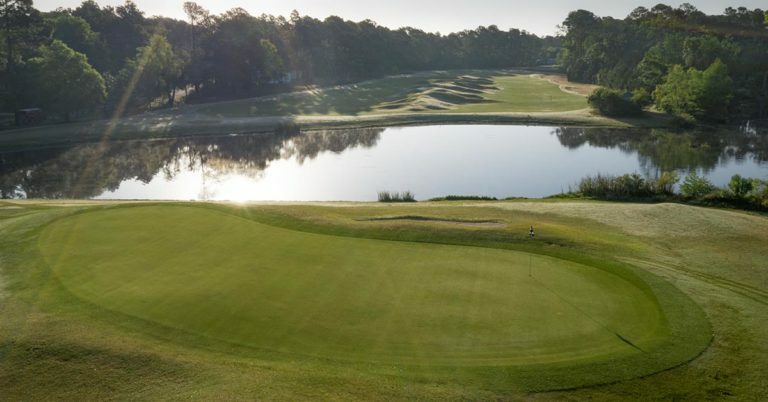 The course was designed by Thomas Walker, former lead designer for Gary Player Design, on what used to be the Sea Gull Golf Club, a Gene Hamm design that dates back to 1966. 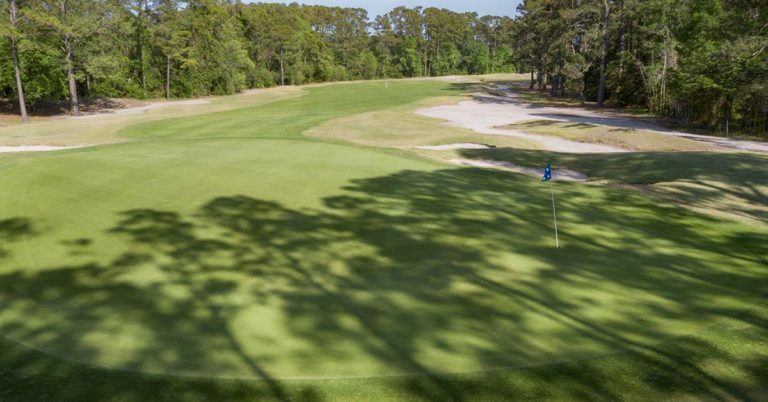 Like much of the surrounding area, the original course was relatively flat. 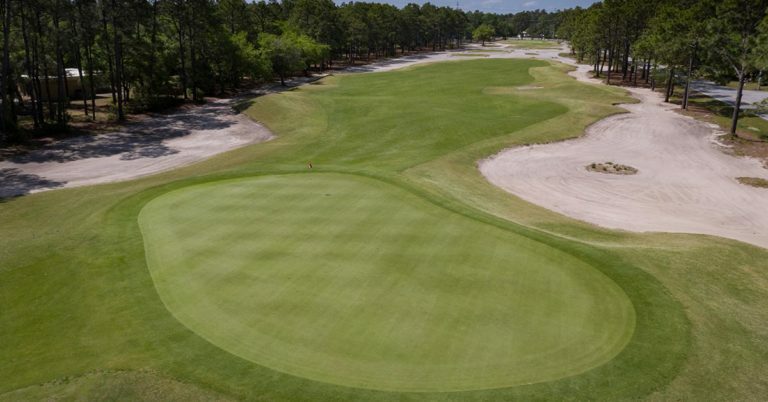 Walker changed the look and feel of the course by moving over a quarter million cubic yards of dirt. 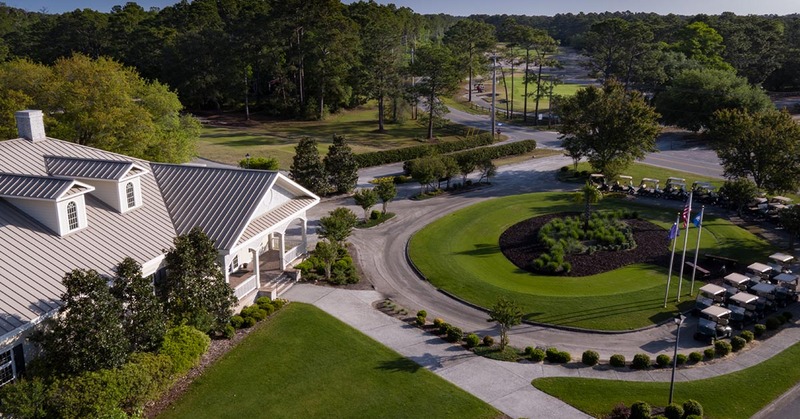 The $7 million renovation project included a new Lowcountry-style clubhouse, overlooking the 18th green. 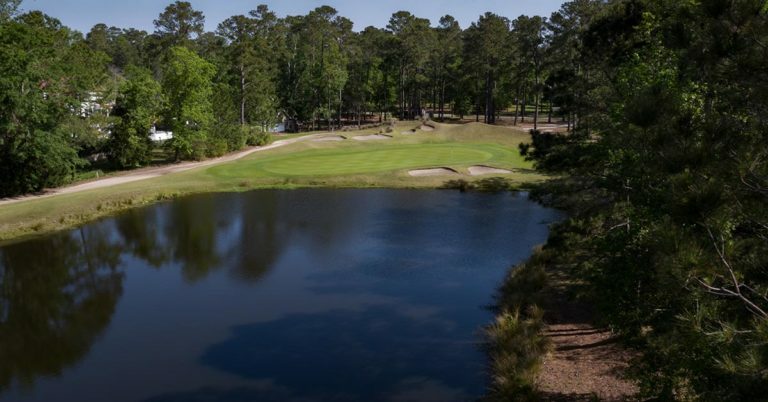 Since Walker’s redo in 2008, Founders Club has received numerous accolades including one of the “30 Best Courses You Can Play in South Carolina” by the South Carolina Golf Course Ratings Panel in 2009 and again in 2011. 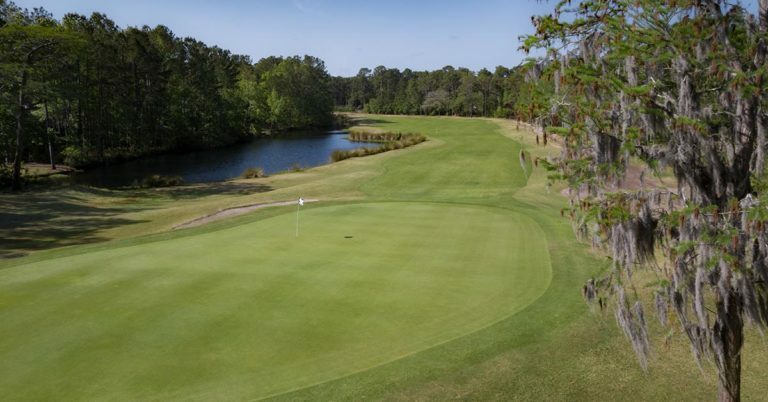 Founders Club was also named “Myrtle Beach Golf Course of the Year” by the Myrtle Beach Area Golf Course Owners Association in 2011. As a result of all the renovation work, Founders Club features sloping fairways, bunkers, elevation changes, and mounding, lots of mounding. 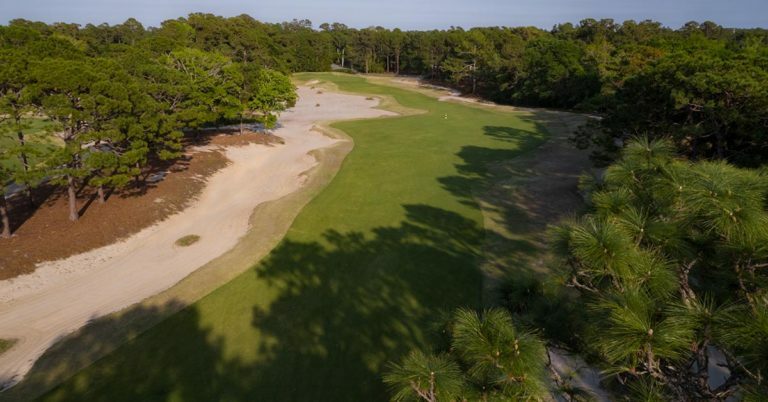 Overgrown rough has been replaced with waste areas filled with native beach sand, pine straw and grasses. 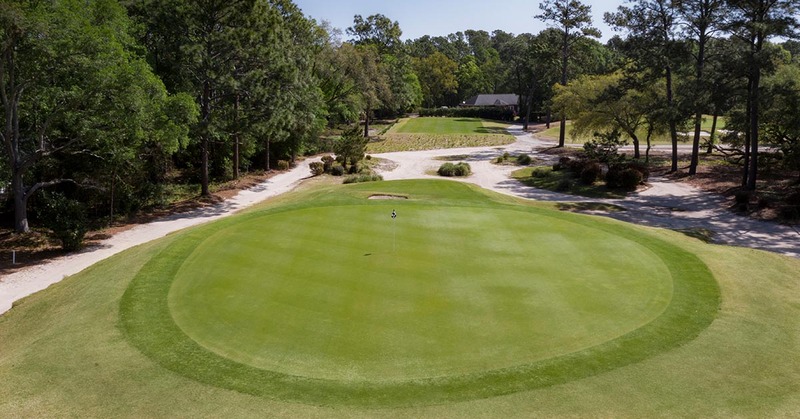 Also sprinkled throughout the course are Lowcountry wetlands, towering live oak and pine trees and azaleas which, when in bloom, add to the beauty of the layout. You won’t find many traditional cart paths out here, instead what you have are waste areas that are in play. 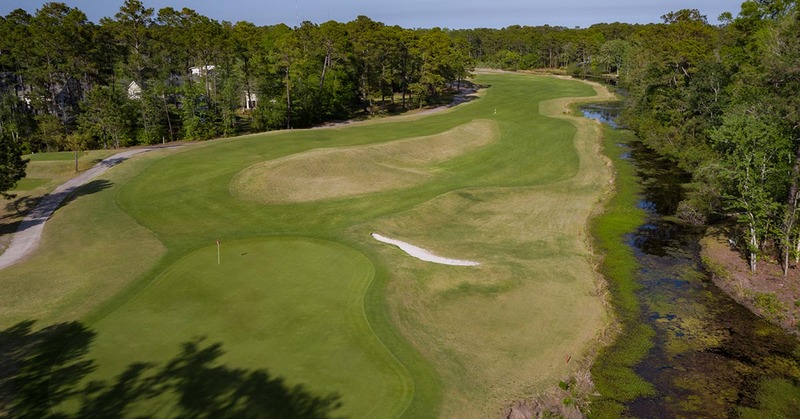 Another feature that sets Founders Club apart from other courses in the area are the Emerald Bermuda greens. This unique strain of grass withstands the summer heat and requires less water than other grasses; it also has less grain. 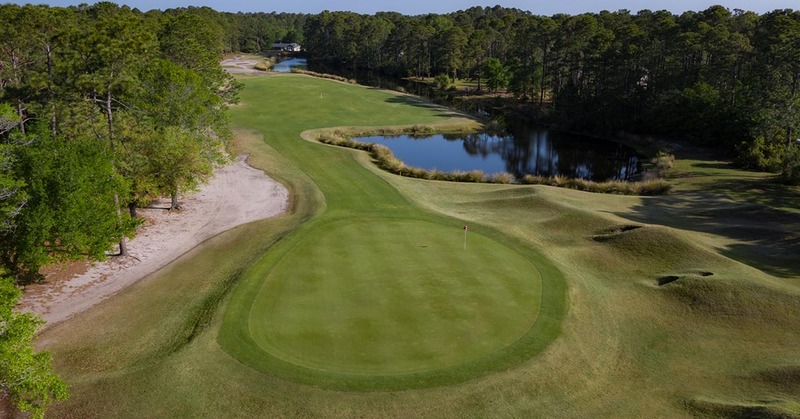 Five sets of tees allow players to choose their level of difficulty. 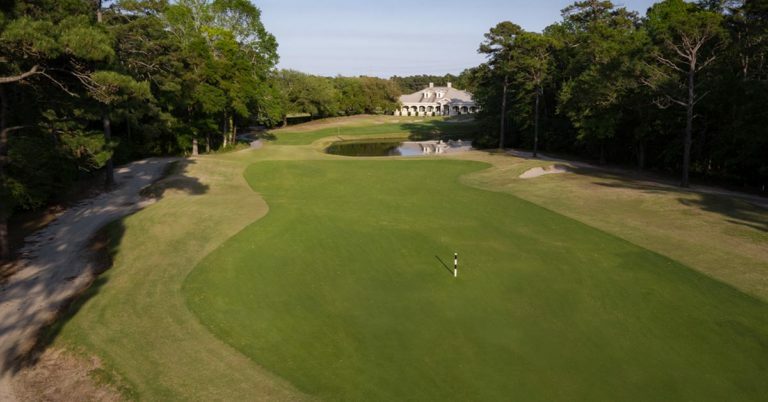 From the Black Tees, Founders Club plays 7,007 yards with a course rating of 74.2 and a slope of 142. Big numbers from the Back tees. 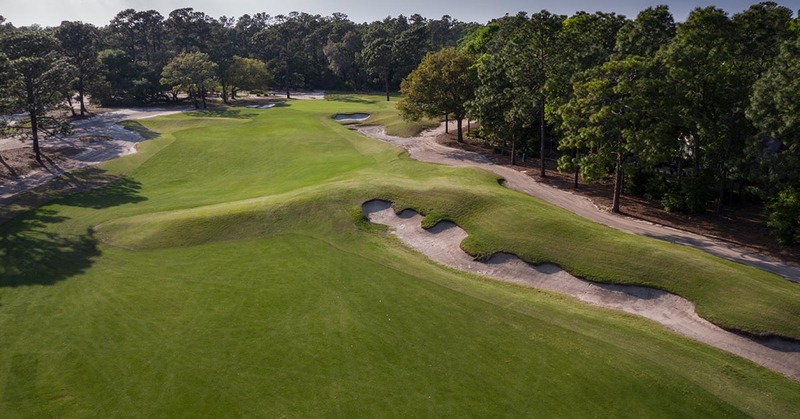 Mere mortal golfers will find that the White tees (6,394 yards/71.2 course rating/133 slope) will give them all the golf they can handle and allow them to leave with a little dignity. Seniors move up to just over 5500 yards while the Ladies will enjoy a length of 4,805 yards. Since you know your game better than anyone, picking the right set of tees will maximize your enjoyment. 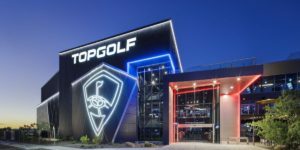 With such a premium on land in the area, there is no formal driving range. Instead there is a hitting net which can accommodate 6 players at a time and a practice putting green where you can also hit some chip shots. Number 2: Par 4, 390 yards (White Tees). Standing on the tee, this long par 4 looks intimidating, with water all down the right side and trees and a waste bunker down the left. The landing area is generous, so take advantage of it. 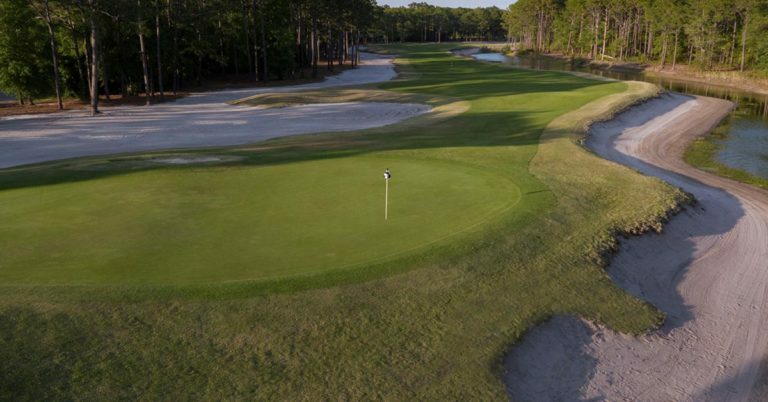 Favoring the left side of the fairway will take the water out of play and give the best angle for approach into a large green with a long, narrow bunker on the right and a small deep bunker about half way back on the left. Keep it on play to the green and you could end up with a low score. Number 3: Par 3, 166 yards (White Tees). Because of the shallow depth of the green, distance off the tee is crucial. It’s all carry over water to an oval green set on an angle. A deep bunker in front guards the right side. If the bunkers behind the green come into play, you weren’t listening when I talked about distance control. The green slopes gently back towards the water. 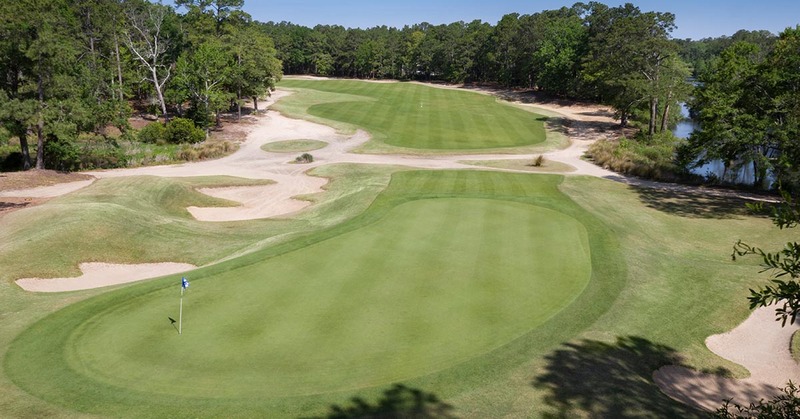 Number 9: Par 5, 493 yards (White Tees). 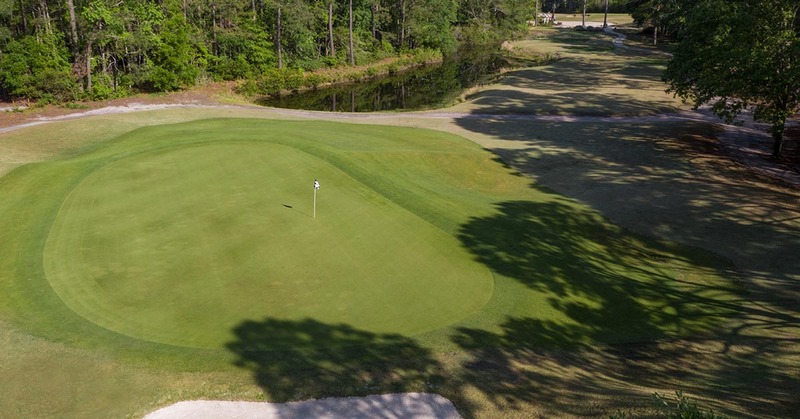 For most, Number 9 is the first hole you see when you enter the property; it’s the one right along the road. Most golfers will comment on the way the sand slopes down into the pond, making it a great looking hole. That being said, if you want to post a low score on this hole, it’s best to avoid the pretty sand and water! This hole can best be described as a narrow strip of grass surrounded by sand – and water. 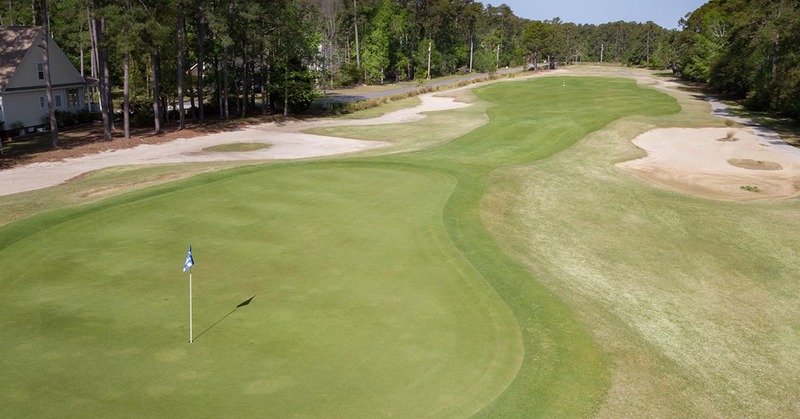 You’ll need to carry your tee shot over a large waste bunker and on to one of these narrow strips of grass – aka fairway. The landing area opens up, however two bunkers on the right and infringing water on the left come into play if you hit it too far. The fairway bottlenecks and then opens back up in the landing area with the right-side waste bunker creeping in and the water on the left. Success so far will leave a short iron into a large green protected front right and in the back by large penalizing bunkers. Par is a good score here. Number 12: Par 5, 491 yards (White Tees). 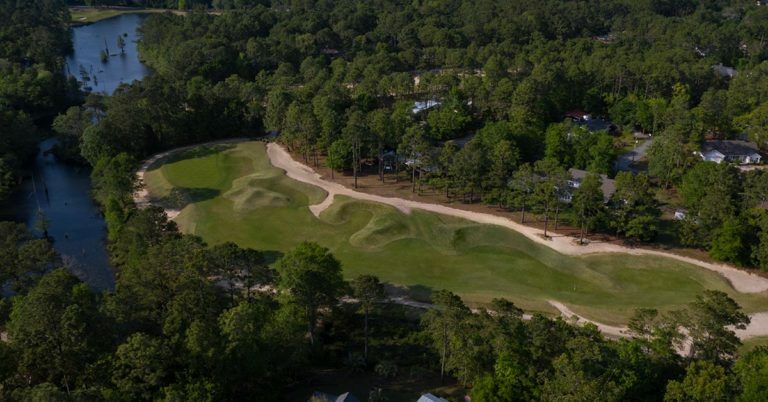 Number 12 looks like a hole straight out of the yardage book of a Scottish golf course with a row of pot bunkers down the middle of the fairway. Most of the time, you want to hit the ball off the tee as far as you can down the middle of the fairway; on this hole it’s not advised! 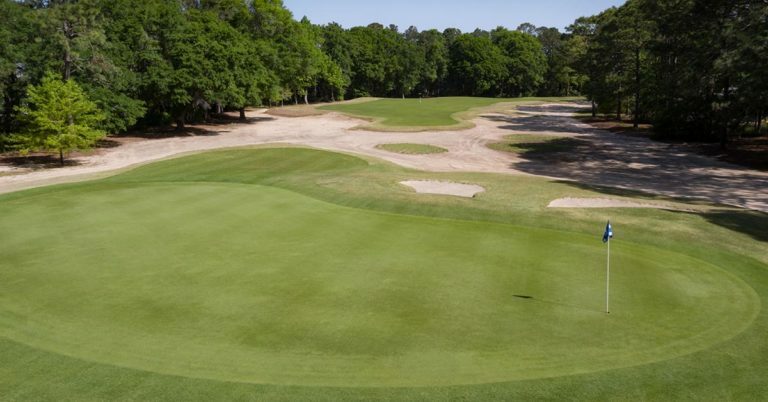 Most players will come up short of the bunkers and have to deal with them on their layup shot. Unless you’re a long ball hitter, you’ll want to hit your layup shot short of the pond and then play your approach shot about 120 yards to a large, receptive green with a deep bunker front left. The fairway is framed on either side by a waste bunker. A challenging but doable hole. Number 16: Par 3, 135 yards (White Tees). What makes this hole interesting is the deep pot bunker in the front middle of the green. You’ll play your tee shot over a small waste area on to the green. 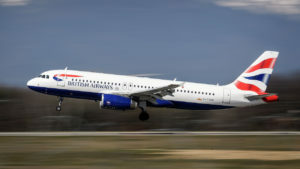 There’s really no bailout area here and you’re going to need to fly it on, so be sure to take enough club off the tee. Founders Club is a difficult but fair golf course. The waste bunkers and pine straw that have replaced the rough are a welcomed change; it’s easier to find your ball and hit out of a waste bunker than some gnarly rough. In fact, every hole has a sand challenge of some sort. There are only a couple of holes that require a forced carry, even for the ladies. Founders Club appeals to just about any type of golfer, whether you like to grip-it-and-rip-it or play it conservatively. Hit the ball as far as you can every time or layup and lay back and play it more strategically. You can play it differently each time. Some players feel that Founders Club plays tough. If you feel the same way after a few holes, consider playing one tee forward from where you normally play at another golf course. If all else fails, the PGA professionals at Founders Club are always happy to give you lessons and help improve your game. Start by hitting some balls into the net to get warmed up and then head out for some real-time on-course learning. 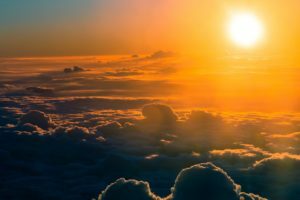 Whether you’re coming down in the spring as part of a larger group or renting a home in the area during the summer months and just want to get away for a few hours, Founders Club welcomes you as a guest. And, if it’s been raining for a few days – as it’s known to do during the summer – odds are that the course is open and playable; it’s one of the best draining courses in the area. If you play a variety of courses in the area, you’ll find that Founders Club is one of the more unique, challenging and fun courses in the area. Ready to book your next round at Founders Club? Click the button below to check rates, tee times, and to book.